a First, that picture. I find artichokes to be quite beautiful, primitive, probably something happy dinosaurs dined on. This recipe calls for artichoke hearts but I don’t have a picture of artichoke hearts. Once out of the jar, I just eat them. No time to take pictures. 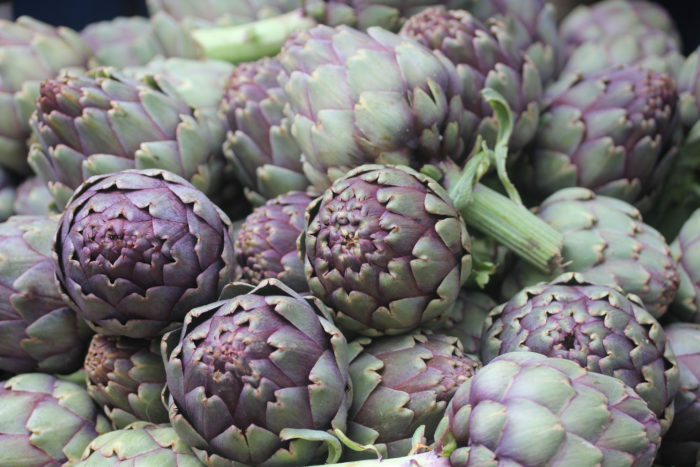 So, imagine the heart at the center of each of those artichokes. Then imagine making a sophisticated comfort food with them: a casserole of chicken, mushrooms, Madeira and those artichoke hearts. You can have this dish on your table in an hour. Perfect weeknight elegance! From A Southern Oven, by Jean Anderson, is the source of this powerful recipe. Preheat oven to 375°F. Lightly spritz shallow 4-quart casserole with nonstick cooking spray and set aside. Combine flour, paprika, thyme, salt, and pepper by shaking in a large plastic zipper bag. Dredge chicken, several pieces at a time, by shaking in flour mixture. Tap off excess flour. Save 3 tablespoons dredging flour to thicken the sauce. Heat oil in large heavy skillet over moderately high heat 1 ½ to 2 minutes until ripples appear on pan bottom. Brown chicken in hatches in oil, skin side up at first, allowing 3 to 4 minutes per side. Drain on paper toweling. Pour drippings from skillet, then spoon 2 tablespoons back in. Reduce heat to moderate, add mushrooms, and sauté 8 to 10 minutes, stirring occasionally, until juices evaporate. Sprinkle reserved dredging flour over mushrooms and stir well. Add broth and cook, stirring constantly, 2 to 3 minutes until thickened. Add wine and simmer 2 minutes more. Arrange chicken skin side up in a casserole, tuck artichokes in and around, and pour hot mushroom mixture evenly over all. Cover casserole with lid or foil. Slide onto middle oven shelf and bake 40 minutes. Remove lid and hake 20 minutes more until an instant-read thermometer, inserted in meaty chicken part not touching bone, reads 165°F. Serve at table accompanied by fluffy boiled rice and a crisp green salad.